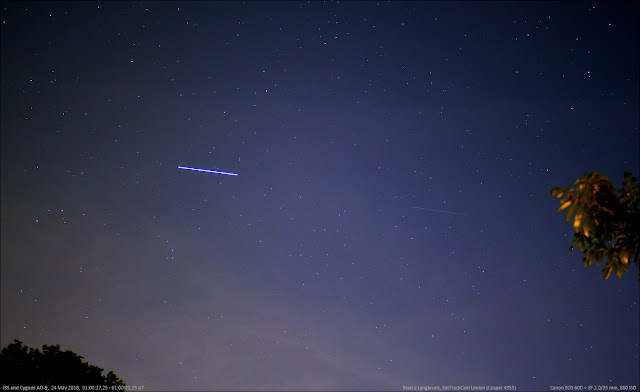 The two images above show Orbital ATK's Cygnus AO-9 cargoshi chasing the International Space Station (ISS), a few hours prior to berthing. The Cygnus OA-9 cargoship, launched on May 21 from Wallops Island, brings supplies (food, equipment etc.) to the Space Station. 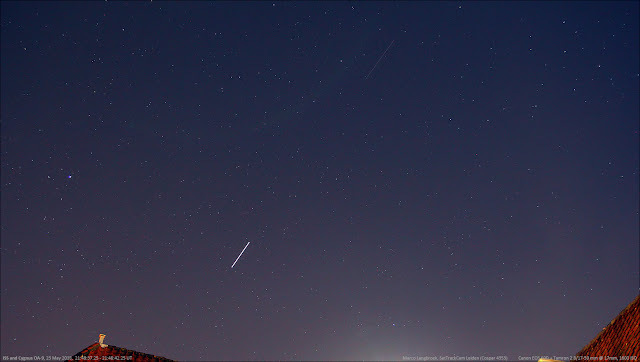 I could observe three passes of the two objects during the night of May 23-24: in all three cases the two objects could be seenr at the same time in the sky, with the Cygnus (the fainter trail in the images above) somewhat behind ISS. The images above are from the first pass (21:48 UT, 23:48 local time), a high pass, and the third pass (01:00 UT, 03:00m local time), low over the southwest horizon. The Cygnus spacecraft was about 22 seconds behind the ISS on the third pass. The sky over Leiden was somewhat hazy. The very short third trail near the ISS on the first image is Kosmos 2392. As usual, the Cygnus spacecraft was quite faint (mag +4.5), so not an easy naked eye target. The brightness of these Cygnus spacecraft is strongly phase-angle dependent. The Dragon spacecraft of their competitor SpaceX are much brighter and easier to see. Always fun to watch. The kids love to watch the Dragon chasing the ISS across the evening sky.